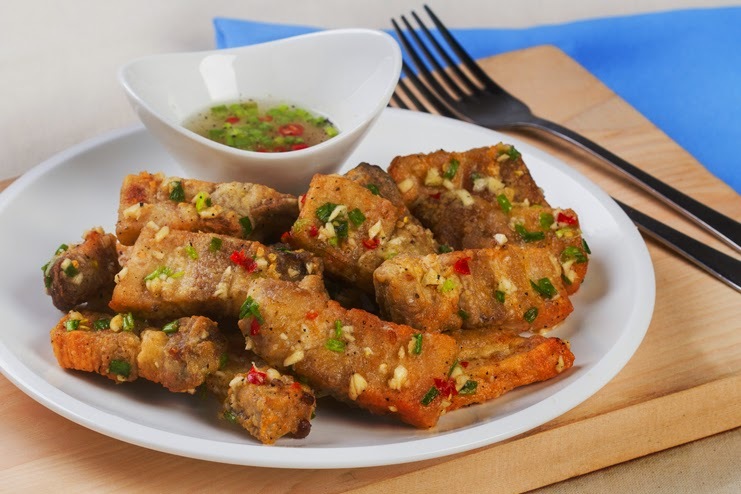 Dress up your ordinary fried liempo with a mouthwatering chili coating! Celebrate this New Year with a bang of spicy flavors in your mouth. 1. Place pork in a pot, add water, MAGGI MAGIC SARAP, pepper and garlic. Bring to a boil, skim the scum and bring down to simmer. Cook for 45 minutes or until tender. Remove from the pot and set aside to cool down to room temperature. 2. Lightly coat pork with cornstarch and deep fry in a preheated oil for 2-3 minutes or until golden brown. Set aside. 3. Combine sesame oil, garlic, siling labuyo, spring onion, pepper and MAGGI MAGIC SARAP in a pot. Heat for 2 minutes over low heat. Toss fried pork and transfer into a serving plate. 4. Prepare dipping sauce by mixing vinegar, MAGGI MAGIC SARAP, pepper, spring onion, water and siling labuyo. Serve with Crispy Spicy Liempo.